This postcard was published by Tregaskis and would have been sold from the shop on Fore Street in Redruth. The photograph was probably taken sometime in the 1890s. 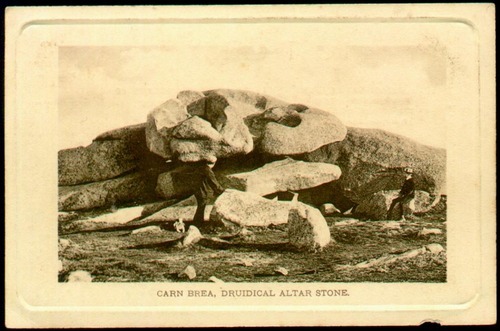 The interest in 'druidical remains' began in the later 17th century with the works of John Aubrey and reached its peak in the following century with the speculations of writers such as William Stukeley and the pioneering Cornish antiquarian William Borlase, who considered the impressive granite hill of Carn Brea to be a major centre for druidical worship. The attribution of these natural, weathered rock formations to the druids had, for the most part, been discounted by the time William Copeland Borlase, the great-great-grandson of William Borlase, wrote Nænia Cornubiæ in 1872. The town of Redruth was unusual in that, here, for many of its inhabitants, the belief in druidical antiquities persisted until well into the 20th century. Image courtesy of and © David Thomas. I have been indeed fortunate in having access on a regular basis to a wealth of early illustrations of Cornwall's ancient monuments, be they in print, in manuscript drawings and paintings, or in early photographs or postcards, and such images can enable us to attempt to understand the minds of those who created the images, as well as giving some small insight into those who constructed the monuments. Any attempt here to conjecture on the rituals and, to some extent, the purposes of the designers and builders of these monuments has been kept to a minimum: theories appear, infiltrate, overthrow, metamorphose, and are themselves eventually overthrown at such a rate as to make any such attempt mere fashion. The theories may change, but the stones remain. As do the illustrations; fixed in time and more unchanging even than those mighty survivors that they depict; though it must not be assumed that any of the illustrations are wholly accurate in their depictions; even when photographic. I have, for instance, seen two roughly contemporaneous postcards showing much the same view of the interior of Crantock Church, and with one showing a set of pews, and on the other, rows of chairs, and where, on closer inspection, it can be seen that in the photo showing the chairs, these have been superimposed. Such chairs were indeed used in that church, but at a later date. And yet it would not be a surprise to find the superimposed version appearing in some published form to illustrate the seating arrangements in use in that church at the time of the original photograph. I have postcards of the Dolmen de Crucuno where, in the printed versions, the corner of a house adjacent to the dolmen and blocking the view of the extreme end of the capstone can be seen, and yet in the photographic version of the exact same image, the house does not appear, the capstone is shown in its entirety, and on closer inspection it can be seen where this area has been doctored. Anyone familiar with illustrations from the 17th and 18th centuries will be all too aware of the large pinch of salt to be taken with regard to the accuracy of their draughting. An illustration of Trethevy Cromlech from the early 1800s shows the relative sizes of the cromlech and the sheep around it such that, had the monument not survived, one might have surmised that either the dolmen was 60 feet tall, or that a remarkable breed of miniature sheep was prevalent in early 19th century Cornwall. I have neglected, so far, to use illustrations by Borlase and Blight due to the profusion of these both in printed form and on the internet, though it would be true to say that no work such as this could be complete without some examples of their profuse arts, and, as it is hoped that additional images will be added here on an ongoing basis, it may be wise for me to add a few of the more obscure examples by these antiquarian trailblazers. Many of the images shown here are rare to find, and some are unique. Monuments such as the cromlechs at Lanyon and Trethevy and the Merry Maidens stone circle were illustrated and photographed on a regular basis, but many, such as the beautifully compact quartz circle at Duloe, the holed stone at Choone, and the stone circle at Boscawen-ûn, were not so well favoured. It was thought appropriate that much of the text accompanying these historical images should itself be of a historical nature and extracts from original sources have been liberally used throughout. Cornwall is indeed fortunate in having such a diverse and rich array of prehistoric monuments, and it must be hoped that early images of some of the more obscure of these still exist. This website is copyright of the author and the images on this page must not be copied or reproduced without the prior written consent of the respective copyright holder. Copies of material held by the Cornwall Record Office, the Royal Institution of Cornwall and the Cornish Studies Library can be ordered via their respective websites by following the links given in the Links page of this website, or at the end of the desciption for the relevant image. The author would like thank the Cornwall Record Office for allowing me to reproduce some of the photographic images held by them. Many thanks must also go to David Thomas for allowing the use of images from his own collection, and for giving access to the original lantern slides featured on this page and allowing photographic reproductions to be made of these. Allcroft, A Hadrian. 1908. Earthwork of England: Prehistoric, Roman, Saxon, Danish, Norman and Mediæval. MacMillan and Co Ltd.
Axford, E C. 1975. Bodmin Moor. David & Charles. Balmer, Howard. 2003. 'The Porthcothan Fogou'. Meyn Mamvro 51, p22-24. Baring-Gould, Sabine. 1892. Strange Survivals. Methuen and Co.
Barnatt, John. 1982. Prehistoric Cornwall: The Ceremonial Monuments. Turnstone Press. Barnatt, John. 1989. Stone Circles of Britain: Taxonomic and Distributional Analyses and a Catalogue of Sites in England, Scotland and Wales (2 vols). British Archaeological Report (British Series) 215. Blight, J T. 1861. A Week at the Land's End. Longman, Green, Longman and Roberts. Blight, J T. 1865. Churches of West Cornwall; with some Notes of Antiquities of the District. Parker & Co (2nd Edition, 1885). Borlase, William. 1754. Observations on the Antiquities, Historical and Monumental, of the County of Cornwall. Printed by W Jackson. Borlase, William Copeland. 1872. Nænia Cornubiæ, a descriptive essay illustrative of the sepulchres and funereal customs of the early inhabitants of the County of Cornwall. J R Netherton & Longmans, Green, Reader and Dyer (Facsimile, Llanerch Press, 1994). Buller, John. 1842. A Statistical Account of the Parish of Saint Just in Penwith in the County of Cornwall with some notice of its Ecclesiastical and Druidical Antiquities. R D Rodda. Clarke, J G D. 1935. 'Notes on Excavations in England, the Irish Free State, Northern Ireland, Scotland and Wales, during 1935 - England, Bronze Age: The Hurlers, near Liskeard, Cornwall'. Proceedings of the Prehistoric Society 1, p134. Cooke, Ian MacNeil. 1987. Journey to the Stones: Ancient Sites & Pagan Mysteries of Celtic Cornwall. Men-an-Tol Studio (2nd edition, 1996). Cotton, William. 1827. Illustrations of Stone Circles, Cromlehs and other remains of the aboriginal Britons in the West of Cornwall. J Moyes (2nd edition, Men-an-Tol Studio, 1998). Daniel, Glyn. 1950. The Prehistoric Chamber Tombs of England and Wales. Cambridge University Press. Dyer, James. 1982. The Penguin Guide to Prehistoric England and Wales. Penguin (Originally Allen Lane, 1981). Fox, Aileen. 1964. South-West England: 3500BC - AD600. David & Charles (Revised edition, 1973). Grinsell, Leslie. 1978. The Druids and Stonehenge: The Story of a Myth. Toucan Press. Halliday, F E. 1959. A History of Cornwall. Duckworth. Harris Stone, J. 1912. England's Riviera: The Land's End District and its Antiquities. Kegan Paul, Trench, Trübner & Co Ltd.
Hencken, H O'Neill. 1932. The Archaeology of Cornwall and Scilly. Methuen & Co Ltd.
Henderson, Charles Gordon. 1912-16. Parochial Antiquities: Deaneries of Penwith, Kirrier and Carnmarth, Part 1. Manuscript, Royal Institution of Cornwall. Hewitt, Charles. 1907. General Index to the Journal & Reports of the Royal Institution of Cornwall from 1818 to 1906. William Brendon & Sons. Iago, W. 1894. 'Notes on Duloe Circular Enclosure'. Journal of the Royal Institution of Cornwall 12:1, p96-106. Jennings, H R. 1936. Historical Notes on Madron, Morvah and Penzance. Saundry. John, George. 1793-1834. The Diary of George John. Manuscript, Cornwall Record Office (AD1426/2). Lewis Hind, C. 1907. Days in Cornwall. Methuen & Co.
Lukis, W C and Borlase, W C. 1885. Prehistoric Stone Monuments of the British Isles: Volume 1, Cornwall. Society of Antiquaries. Matthews, John Hobson. 1892. A History of the Parishes of Saint Ives, Lelant, Towednack and Zennor. Elliot Stock. Norden, John. c.1590s. Speculi Britanniæ Pars: A Topographic and Historical Description of Cornwall with A Map of the County and each Hundred; in which are contained the Names and Seats of the several Gentlemen then Inhabitants; As also, thirteen Views of the most remarkable Curiosities in that County. William Pearson, 1728. Opie, Iona, and Tatem, Moira (eds). 1989. A Dictionary of Superstitions. Oxford University Press. Preston-Jones, Ann. 1993. 'The Men an Tol reconsidered'. Cornish Archaeology 32, p5-16. Redding, Cyrus. 1842. An Illustrated Itinerary of the County of Cornwall. How & Parsons. Royal Commission on the Historical Monuments of England. 1994. National Monuments Record, long listings for Neolithic and Bronze Age ceremonial and sepulchral monuments in Cornwall. Print-out from the RCHME, 29 March 1994. Royal Institution of Cornwall. 1841. Twenty Second Annual Report, 1840. Printed by L E Gillett. Russell, Vivien. 1980. Isles of Scilly Survey. Isles of Scilly Museum and the Institute of Cornish Studies. Stockdale, F W L. 1824. Excursions in the County of Cornwall, comprising a concise historical and topographical delineation of the Principal Towns and Villages, together with descriptions of the Residences of the Nobility and Gentry, remains of Antiquity, and every other interesting object of curiosity. Simpkin and Marshall (Facsimile, D Bradford Barton, 1972). Straffon, Cheryl. 1992. The Earth Mysteries Guide to Ancient Sites in West Penwith. Meyn Mamvro Publications. Straffon, Cheryl. 1994. The Earth Mysteries Guide to Mid Cornwall and the Lizard. Meyn Mamvro Publications. Tangye, Michael. 1981. Carn Brea: A Brief History and Guide. Dyllansow Truran. Thomas, Charles. 1985. 'Carwynnen Quoit'. Camborne Festival Magazine 20, p14-15. Tregelles, G F. 1906. 'The Stone Circles'. Victoria County History of Cornwall 1, p379-406. Weatherhill, Craig. 1981. Belerion: Ancient Sites of the Land's End. Alison Hodge. Woolf, Charles. 1970. An Introduction to the Archaeology of Cornwall. D Bradford Barton.